by Cathy Lynn Pagano, M.A., C.E.C. by Paul DeBlassie III, Ph.D.
A liana is any of various long-stemmed, woody vines that are rooted in the soil at ground level and use trees, as well as other means of vertical support, to climb up to the canopy to get access to well-lit areas of the forest. Lianas are especially characteristic of tropical moist deciduous forests and rainforests, including temperate rainforests. Lianas can form bridges amidst the forest canopy, providing arboreal animals with paths across the forest. These bridges can protect weaker trees from strong winds. Dolio is the hero and journey maker for his people who reside seven miles inland in the rain forest near Tamarindo, Province of Guanacaste, Costa Rica. While most of what he knows about the west is apocalyptical, he is determined to deploy his jungle love to build additional income and a sacred union between the growing tourist trade and his extended family. What many call “eco-alchemy” is called something else in his native language; Dolio is practicing important transition strategies to stay healthy and knows his part in the balancing act for a new sacred Earth. One key idea for Dolio’s community is to live and work locally, keeping costs down—and using abundant resources. A second guide is the caring for the community ethic from permaculture. 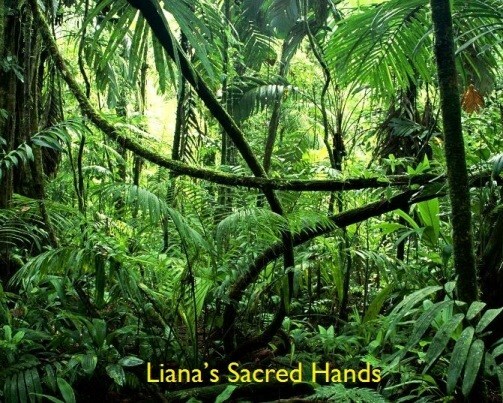 Liana is a multi-variety local rain forest woody vine that grows fast and has many uses in his village including lattice structure for the dome roofs, perimeter security and large baskets to carry dirt and food. Villagers wear the bright and colorful flowers when they are in bloom. Dolio wants to create a sustainable village and sees a way to earn money for his people and share sacred values with the tourists on the beach through basket weaving workshops. But he is shielding westerners from his village at this time for health, legal and economic concerns. The village council has adopted a resilience creed that means that they can teach and share goods and stories between the contrasting cultures using symbols, like vine baskets and flowers. The village understands the deeper spiritual power and service of their symbols and wants to bolster their use on the coast. Like on their new workshop banner, simple symbols do not need an interpreter. Willi Paul is a green certified business and sustainability consultant who launched PlanetShifter.com Magazine on Earth Day 2009 to build a database of interviews and articles about innovation, sustainability, and the mystic arts. His bliss renewed in 2011 when he designed openmythsource.com to produce new mythic stories with modern alchemies. His work now focuses on what is sacred is to us, the community building power of permaculture and the transformative energy in the new alchemy (ex: soil, sound, digital) and global mythologies. Willi earned his permaculture design certification in August 2011 at the Urban Permaculture Institute, SF. Willi’s work is featured in an article at the Joseph Campbell Foundation and additional videos are available on YouTube.com. See more at www.NewMythologist.com.